Yonezawa was a very successful Japanese toy robot manufacturer of the late 1950s to 1970s and one of my favorite all time toy companies in terms of originality and innovation. They released hundreds of toys and although I will not describe all of them, I will spend some time reviewing some of the more classic Yonezawa robots and toys on this page. Cragstan Astronaut Space Explorer Directional Robot Space Car Did You Know? 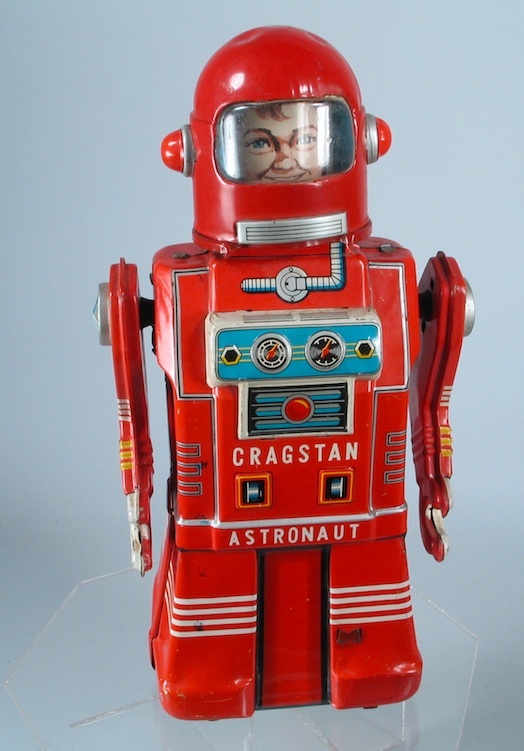 In the late 1950s Yonezawa released the Cragstan Astronaut Robot. Complete with bright red lithographed tin, this robot works with a hand crank friction/gyro mechanism to make it move and makes a rat-a-tat sound as it goes along. The hand crank is often missing. The Space Explorer is a classic Yonezawa robot and is highly sought after by collectors. Battery operated, the Space Explorer will pop open it's head, walk and a view screen on it's chest will lower and light up. 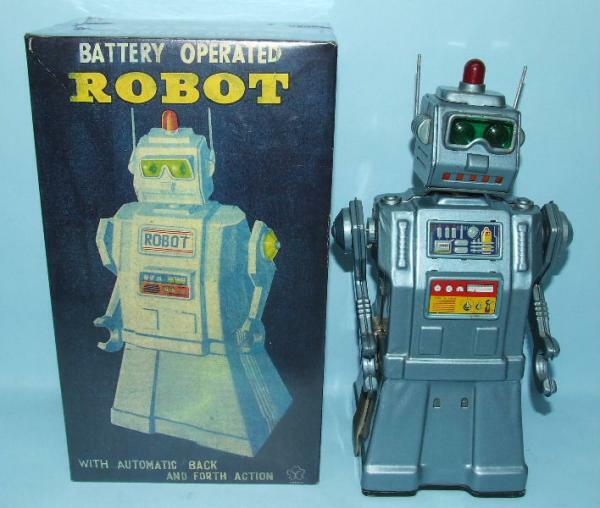 A very awesome classic robot toy for sure and it came in multiple colors including this metallic blue and red. 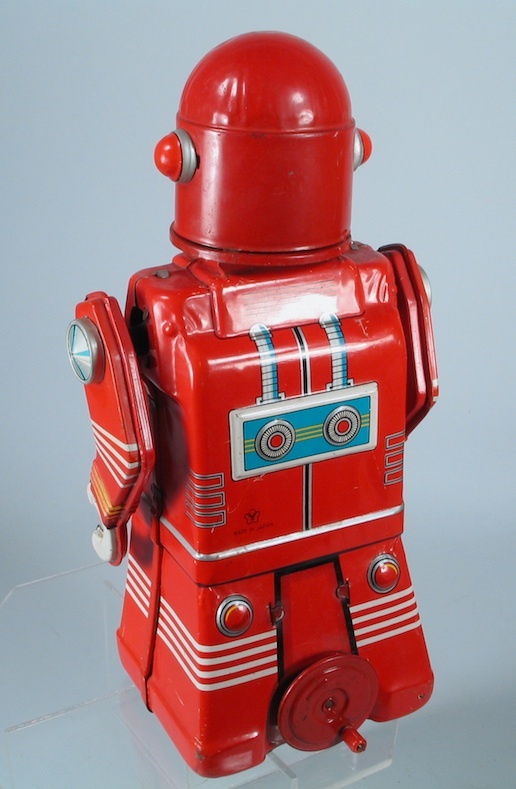 The "Directional Robot" was released in the early 1964, with it's first version having embossed bars on the left and right of the lithographed chest area. Later versions did not have these and had a few other small changes. When turned on the Robot moves about with a bump and go action, his head moves in the direction it is moving in and changes when it reaches an obstacle, hence the name "Directional Robot"and the light in his head illuminates his green eyes, red mouth and red dome on top of his head. The toy features tin construction skirted body with embossed parts, swinging arms and multiple battery operated actions. Made In Japan is printed on his chest and the Yonezawa toy logo and Japan are stamped on the bottom of the toy. Measures 11" tall. 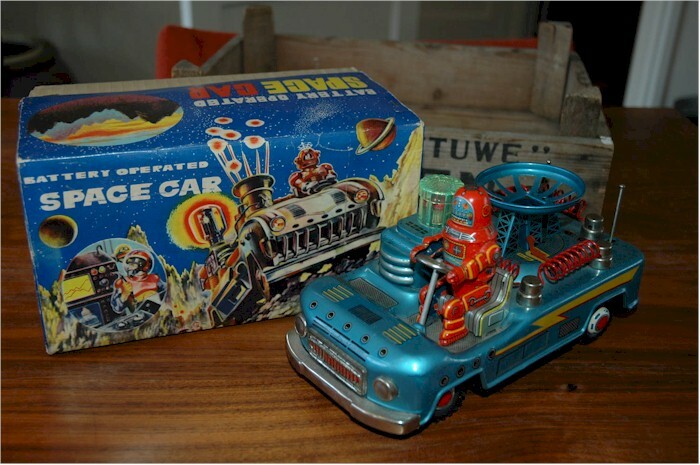 This Robot Space Car, build by Yonezawa in Japan in 1958 is a fantastic and highly sought after robot toy. It features stop and go action, a Robby like robot behind the steering wheel, flashing lights, a lever which can be used to shift the car into its first gear and a blowing system to keep a floating satellite in the air that can be adjusted in 2 steps. 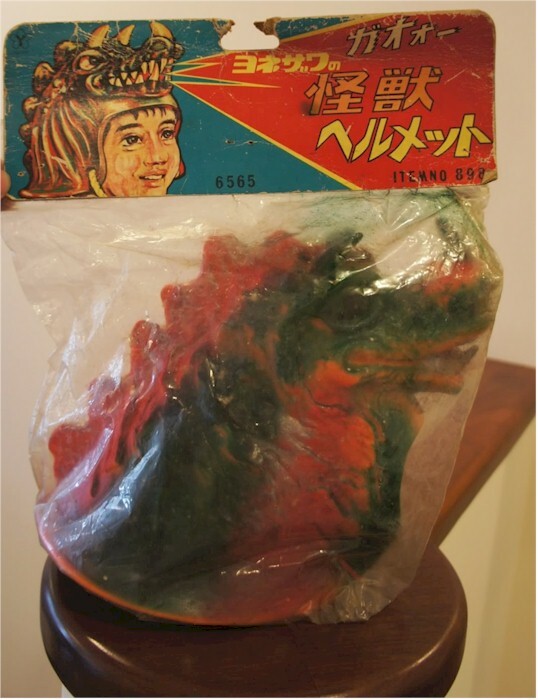 Something that might surprise you - desperate to cling to life, Yonezawa ventured into vinyl toys in the late 60s and 70s, and released small kaiju of various forms but also awesomely horrific life-size helmets of various kinds. Gotta love this at Halloween!